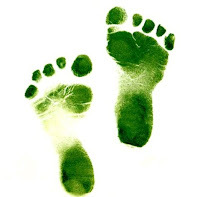 Green Baby Clothing Company is fabulous firstly because we have super cute Earth friendly items but ALSO because it combines the talent of seven Moms who bring their talents to Green Baby! Most of the work happens "after hours" and when I happen to luck out on getting both kids to nap at the same time!! Make sure all the product that goes out is 100% perfect! Enjoy what you do or you won't be able to do it for very long! And... Have fun with it! Out of all the products you make/sell, which one is your favorite? I love our "support local farmers" tee!! And all our fun hats! Shop at Green Baby Clothing Company online. who said they'd take a Medium, Honeydew Bottombumpers. One of the best things about this blog is all of the wonderful people I come in contact with. Rhonda, from Sweet Lil Dimples Baby Shop, emailed me about some ad space and while we were sending emails back and forth, I found out that she really enjoys spreading the cloth love and giving back to the community. Plus, she's a mom of four children and still runs a cloth diaper store. That's pretty awesome! Something else that's pretty awesome - Sweet Lil Dimples Baby Shop wants to give one of you a Bottombumpers Perfect Size Diaper in your choice of color and size and a sample of Rockin' Green Detergent! Visit the Sweet Lil Dimples website and tell me what color and size of Bottombumpers you'd like to win. 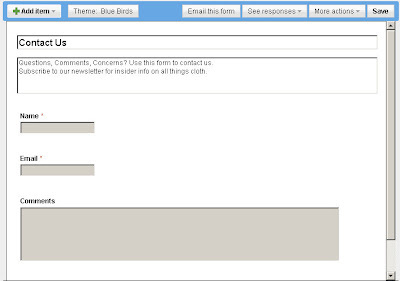 Let me know how you like the new entry form. Giveaway ends Sunday, October 31st, at 11:59pm CST. Since there was a good response on my last tutorial, I figured I'd push my luck and try another one. Google Docs are a fabulous thing. Easy to use and accessible anywhere. 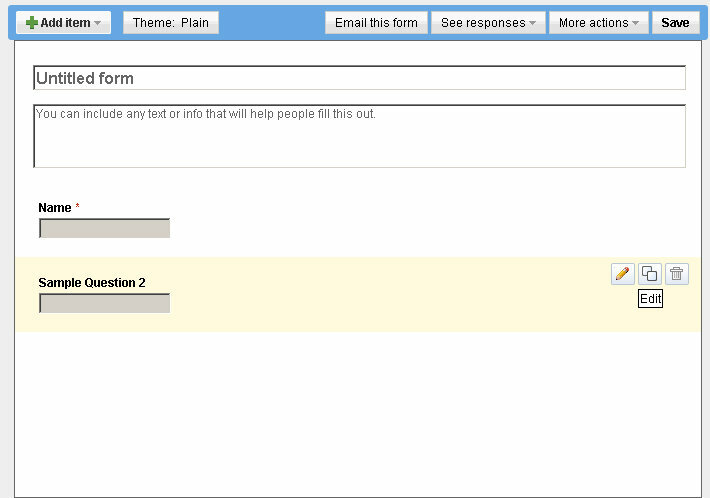 It wasn't until maybe a month ago that I realized they had an even more fabulous thing - Google Forms. 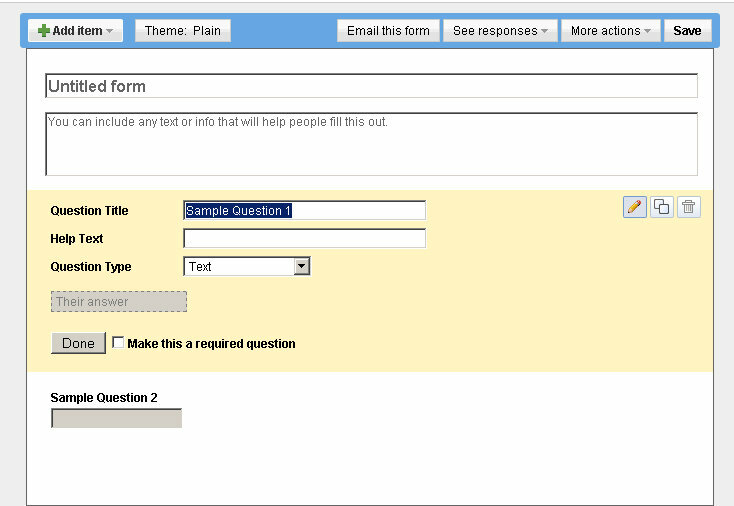 What I love about Google Forms is that you can embed it in a website, blog, or email and all of the responses are automatically entered into a nicely organized Google Docs Spreadsheet. I use Google Forms for the Contact Us form on the sidebar here, but I've noticed a few blogs also using these for giveaways instead of the typical, 'Comment on this post'. I might even follow that trend. Besides making it easy to pick the winner - Google spreadsheet entries are numbered - it's also much more confidential for the readers since they don't have to leave their email address for everyone to see. The only drawback I can see would be that, since other readers can't see the entries, there's no way for the blogger to verify that the winner was really randomly drawn. 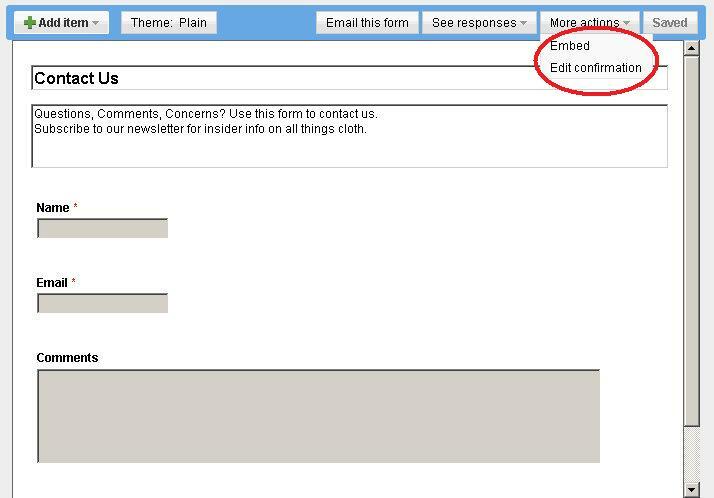 Anyway, I'm going to show you how to embed a Google Form into your blog at blogger, but you can use this same concept in a website or email. If any of you figure out how to embed the form into a Facebook tab, please let me know! 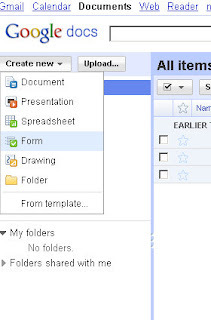 If you don't already have a Google account, create one and then head over to Google docs. 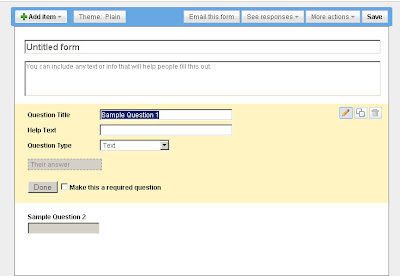 From there, select Create new and then select Form. 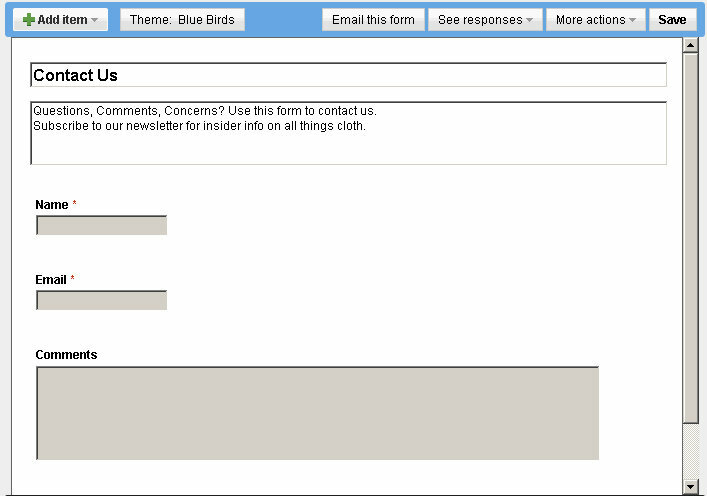 For my questions, I used name, email, comments, and added a checkbox for the newsletter subscription. You can also change the look of your Contact Form by changing the theme, but I find that the plain theme works the best in blogger. Once you have that done, you can edit the confirmation screen and embed your form. I left my confirmation message as it already was. 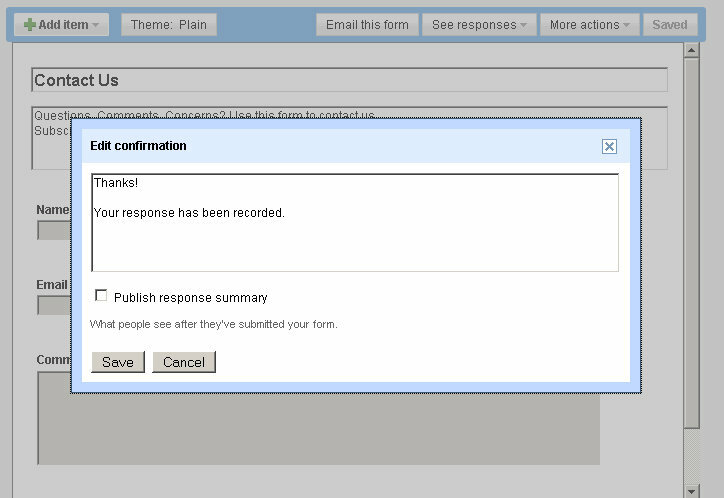 Unless you want everyone to see all the responses, leave the Publish response summary unchecked. If you check that, then as soon as someone submits their answers, they will see all the other responses too. 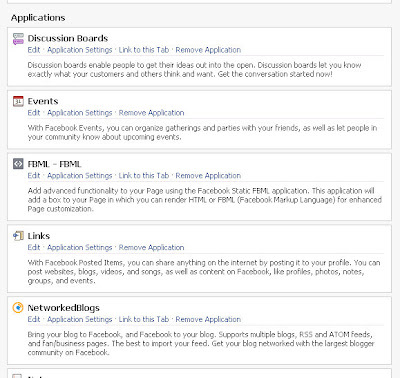 Go back up to More actions and select Embed. You should get a little pop up box with your embed code in it. 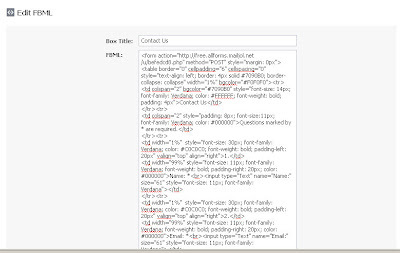 More than likely, you'll have to change the width of your contact form so that it'll fit in your sidebar. 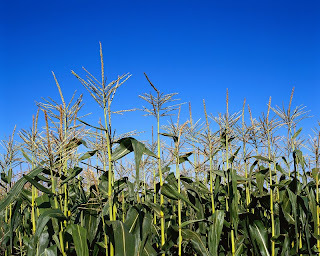 My sidebar width is 250, so I changed the form width from 760 to 230. 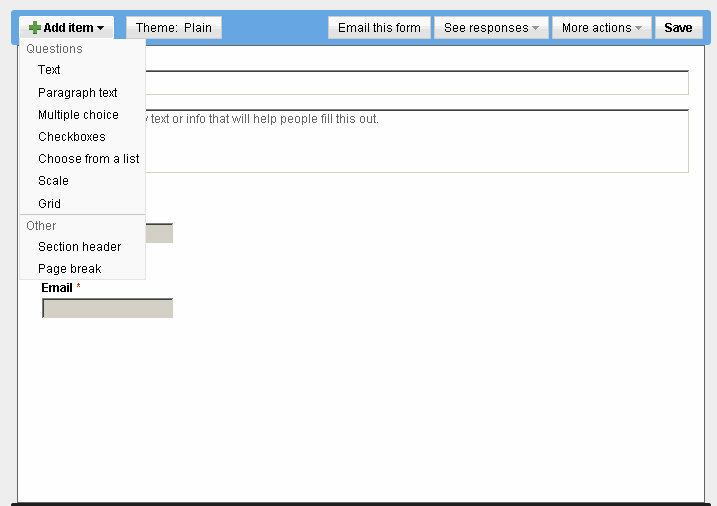 You can also change the length of your contact form. If it's too short, you'll have a scroll bar on it. I changed mine from 624 to 700. This is one of those things that you might have to mess with a little bit before you get it exactly how you want it. 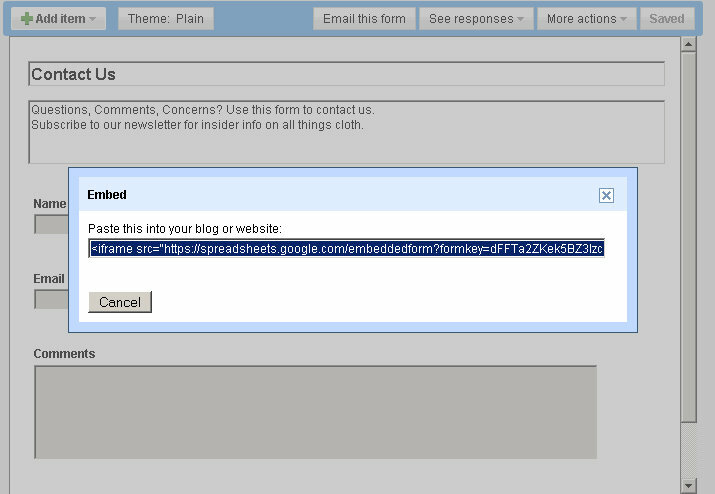 Here's what my contact form looks like in the blog sidebar. 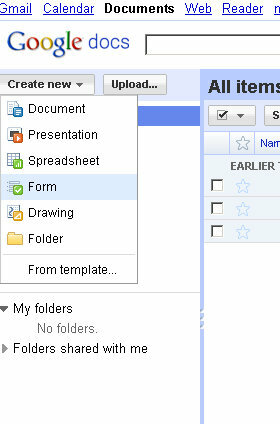 To see the form entries, go back to your Google docs account and click All items. A spreadsheet with the same title as your form should be there. Disclaimer: There is a reason I'm not a teacher, so if I have utterly confused you with this tutorial, please leave a comment with any questions you might have. ﻿The Contact Us form on Facebook was one that stumped me for a long time. I wanted one, but I had no idea how to do that static FBML, or whatever it's called, thing. I tried and ended up with a Contact Us tab that had all sorts of weird gibberish on it. After many late nights (thanks to my love affair with caffeine) I finally figured out how to create a basic contact form for the I Heart Fluff Facebook page. 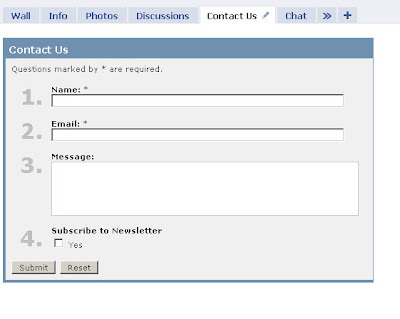 For just a basic contact form, you can leave it as is. But, I would at least change the title to Contact Form. If you want to add more questions, that's simple to do too. I decided to add a little check box for people to sign up for our newsletter. 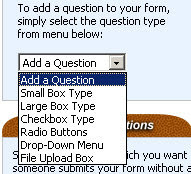 To do that, I selected 'Add a Question' and then 'Checkbox Type'. Then, a little box appears and you just fill out the information you want. So, if you want to make a subscribe to newsletter check box, just type 'Subscribe to Newsletter' for your question and 'Yes' for your answer choice in the second box. 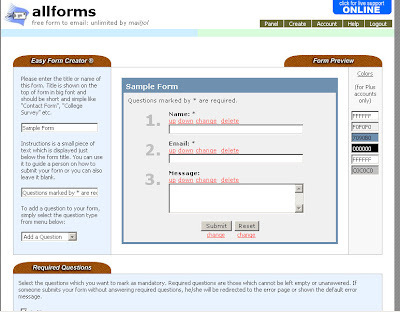 After you create your form, there are a few more questions to answer before you can save. Basically, this just comes down to your personal choice, but make sure you select an email address so you can receive the form comments. 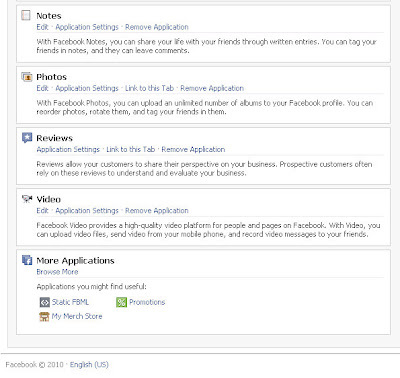 But, before you can use that code on Facebook, you need to set up a Static FBML tab. First, go to your Facebook page and select 'Edit Page' directly below your profile picture. If you haven't already added a FBML tab, just scroll down to the bottom of the page and under More Applications, there should be a Static FBML option. On the Static FBML page, select Add to my Page right below the question mark profile pic. If you already have a Static FBML tab, after you go to Edit Page, just select edit for the FBML application and then scroll to the bottom of the page and select Add Another FBML box. Once you've added the FBML tab, go back to your page and select Edit Page again. 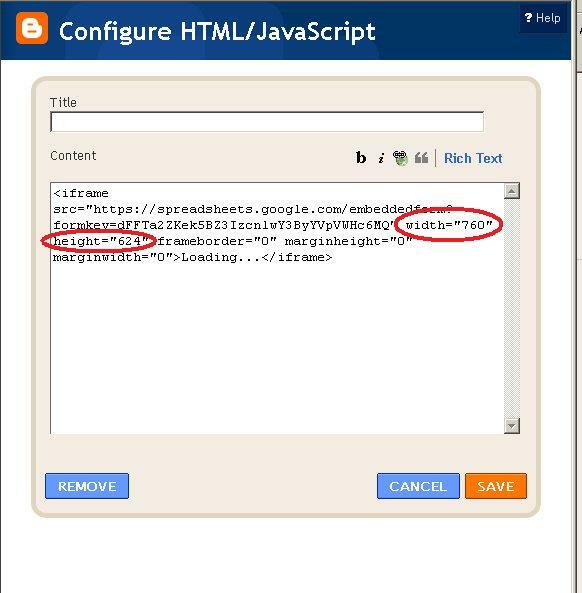 Then select Edit under the FBML Application. 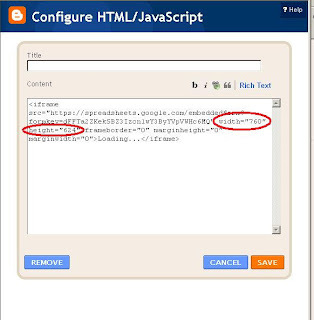 Once you're at the Edit FBML page, just type in the title you want for the tab and then copy and paste the code you created back at allforms. Save it and you're done! 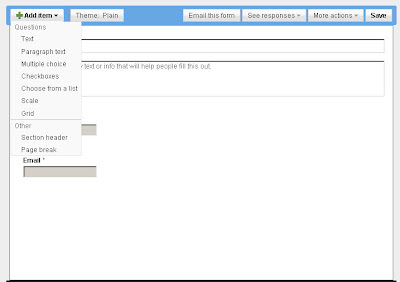 You should get an email whenever anyone contacts you through this form. 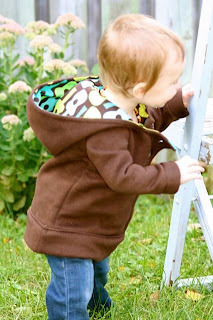 If you like this post, I'd love for you to go vote for us over at Top Mommy Blogs! Two clicks and you're done. I follow this blog. Lemon Sugar sounds good. 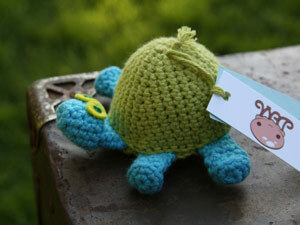 Please email me at clothchronicles@gmail.com to claim your prize. I'm always a little hesitant when it comes to trying a new cloth diaper detergent. It took us awhile to find a wash routine that works good for our diapers so the thought of switching things up can almost give me a mini panic attack. But, I had heard such great things about Miss Lily's Washing Powder that I was willing to take the chance and I'm glad I did! I first used Miss Lily's on our regular clothes and towels and I could tell the difference after just one wash in Miss Lily's. They were brighter and softer. It's amazing how leftover detergent residue can make your towels stiff and scratchy. It even got those grape jelly (little man's favorite new food) stains out of my son's shirts. Think I'm done with the review? Nope! The real test in our house is if it can clean hubby's work jeans. Harvest is in full force here, which inevitably means breakdowns and my husband crawling under some piece of machinery to fix it. Yep, grease stains galore! Miss Lily's passed the test with flying colors! Here's what the water looked like - yummy, huh? Of course, some of the grease stains have been there since way before Miss Lily's, but the Washing Powder still did a fantastic job. Way better than any of the detergents I can buy in the stores around here! 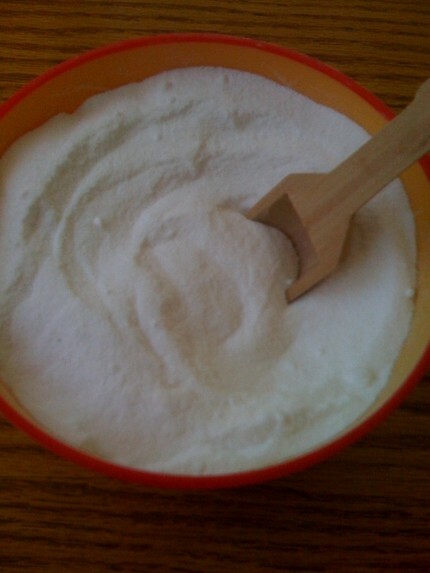 Want to buy your own Miss Lily's Washing Powder? Visit the Miss Lily's Etsy Store and pick out your favorite scent. A full bag is only $10.50 and will do up to 96 loads in a HE washer. Visit Miss Lily's Etsy Store, then comment on this post with the scent you'd like to try. This giveaway will end on Sunday, October 24th at 11:59pm CST. 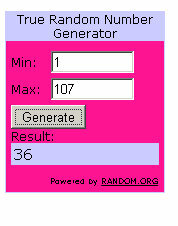 Winner will be picked via random.org. 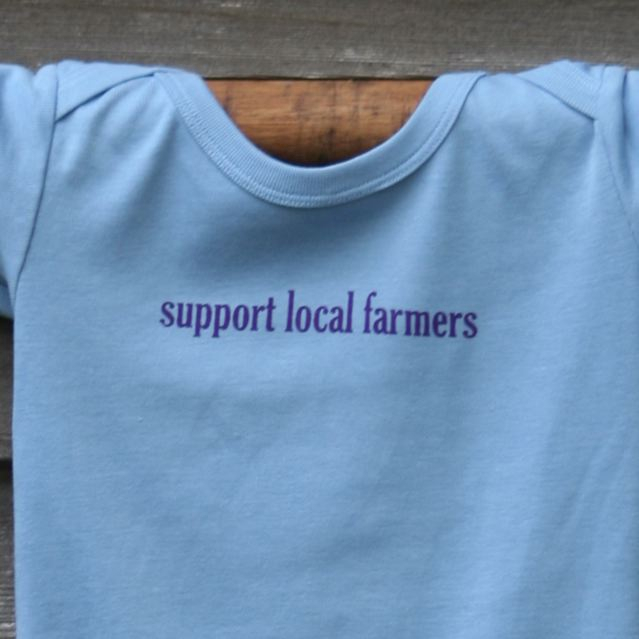 You've all heard me talk about the farm and all the normal farm stuff we do. 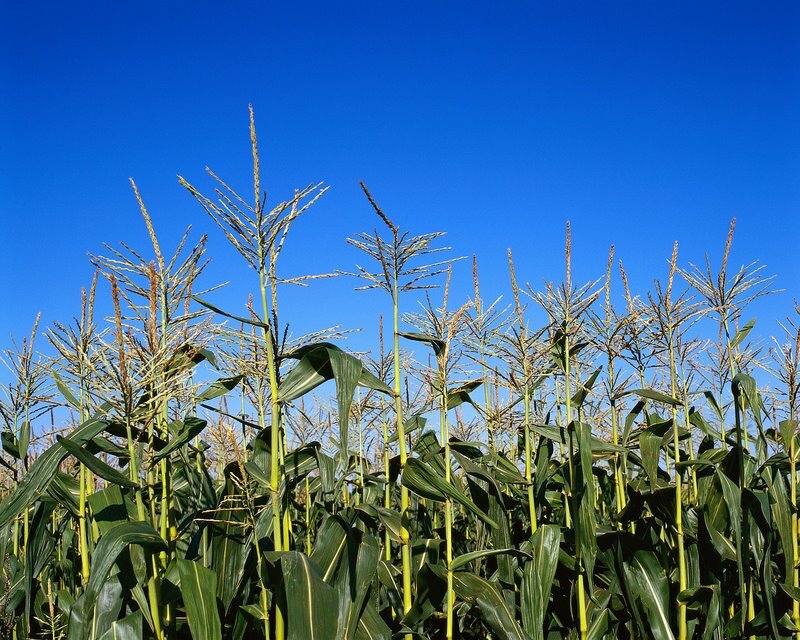 We raise the normal crops, like corn, wheat and soybeans and the normal animals like beef cattle. But my own little claim to fame are the unusual animals that I take in and claim as pets. No, my husband still hasn't convinced me that farm animals cannot be pets and I doubt he ever will. The very first unusual animal we had on the farm were the fainting goats. I love these animals! No, they don't really faint. 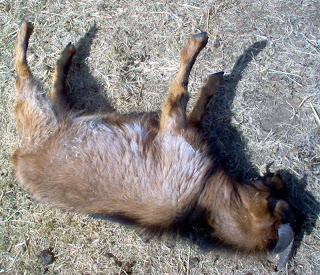 Their true name is Myotonic goats, named for the condition that causes their muscles to contract when they get startled. Although, my goats will also 'faint' when they're excited, especially when they see me coming with the feed buckets! Baby Fainting Goats - Aren't they cute? Jasper when we first bought him. 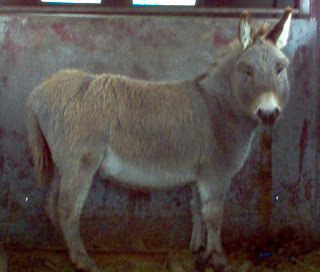 His poor hooves were completely overgrown! After he had been with us for a few months! My next unusual purchase was our Highland cow. 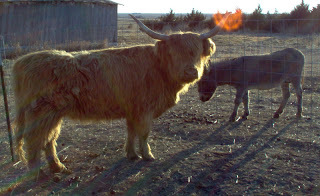 I had wanted some Highland cattle for a while and there was a local exotic animal auction that had a yellow Highland cow listed on their sale bill. Hubby wasn't too thrilled with the idea, but he said if I paid for it on my own he'd go along with it. So, I went to our banker and asked for a small line of credit to buy 1 cow. Remember, we live in farm country so no one ever gets a loan to buy just 1 cow. My banker gave me quite the look, but he thought the cow looked interesting so he let me borrow the money. Except for eBay, I have never bid on anything at any auction my whole life, but I was determined to get that cow. It came down to a bidding war between me and some big ol' rancher. I ended up winning, after getting some dirty looks from him and his friends. Called hubby and brought the cow, now named Harriette, the Hairy Cow, home where she roamed with the fainting goats and Jasper. Don't let the horns scare you, she's actually pretty gentle. The only thing I ever have to worry about with her is that she gets really excited when it's feeding time and starts bouncing all over the place. You have to be careful around a cow with a 6 foot hornspan that likes to jump around! 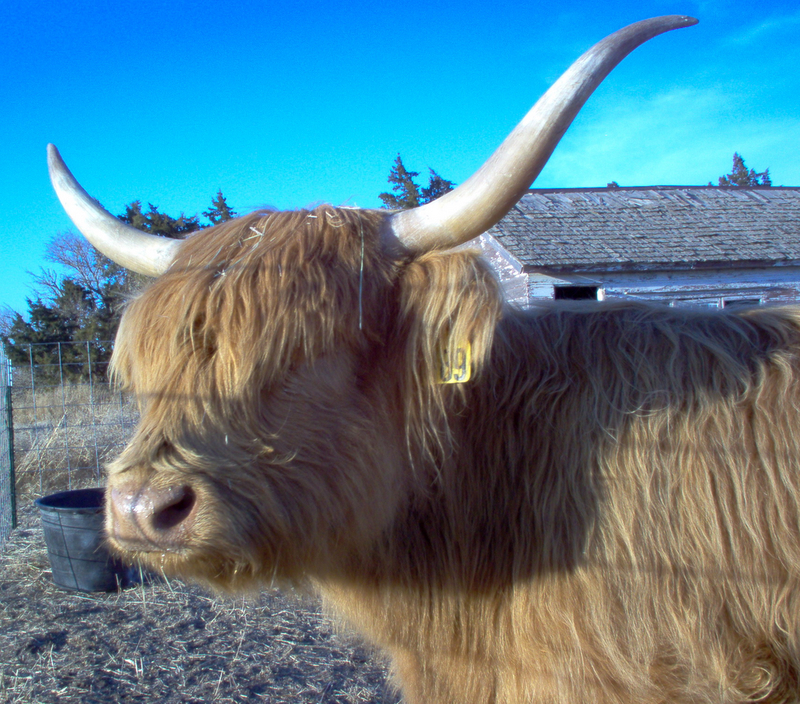 Harriette eventually had to be moved in with the rest of our cattle after she used her horns one too many times to pick up and get out of the fences I had set up for the goats and Jasper. We would get calls from neighbors saying that they saw our 'Yak or whatever the heck that thing is' in a pasture or field. She's still in with the rest of our cattle and has even produced a couple Angus/Highland cross calves.